For 13 years the Per Artem ad Deum Medal has been awarded at the Targi Kielce' SACROEXPO. 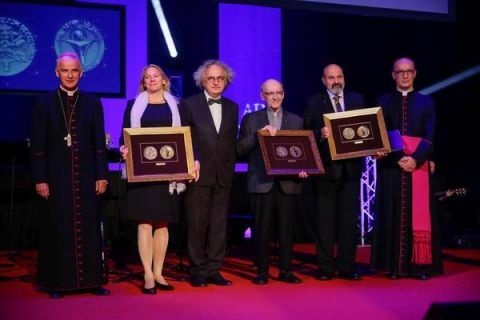 The Medal has been awarded to artists or institutions whose artistic achievements and heritage contribute to the culture development and shapes man's spirituality. The Medal Chapter chaired by Fr. Bishop Marian Florczyk PhD resolved to include the following artists to the Medal-laureate fellowship: Father Professor Michał Kazimierz Heller - a Polish philosopher, theologian, cosmologist. Fr Heller is employed at the Vatican Observatory. He is also a member of the Pontifical Academy of Theology. Claudia Henzler - a photographer, the laureate of the St Leopold Peace Prize. Mrs Henzler connects people from different backgrounds and cultures; and Rev. Tomas Halik - a philosopher, theologian, psychologist, one of the most outstanding Catholic thinkers of today. The ceremony was graced with the presence of the Medal laureates, including Krzysztof Zanussi who spoke about the meaning of arts for man. The event gained extra splendour with the Polish Radio Choir performance - the ensamble performed Arvo Part's "Stabat Mater". The choir was conducted by Szymon Wyrzykowski. The Pontifical Council for Culture is was founded in 1982 upon the initiative of Pope John Paul II. Establishing it, the Holy Father emphasized that: "the dialogue of the Church with cultures of the contemporary world constitutes a significant area of activity, in which in the last years of the 20th century the future of the world has been shaped”. The laureates fellowship includes: Stained glass workshop "Furdyna", Dobrosław Bagiński, Stanisław Słonina, Leszek Mądzik, Krzysztof Zanussi, Stanisław Niemczyk, Wojciech Kilar, Ennio Morricone, Stefan Stuligrosz, Stanisław Rodziński, Mario Botta, Adam Bujak, Herder Publishers, Krzysztof Penderecki, Wincenty Kućma. The SACROEXPO in Targi Kielce continues until Wednesday.